A steak bomb is a hot grinder sandwich [grinder is an item in the submarine sandwich lexical set, which also includes sub, hoagie, and Italian sandwich; see my 8/22/11 posting on the names] consisting of shaved steak [some New Englanders insist this must be steak tips, not steak shavings] and melted provolone or mozzarella cheese with grilled onions, sautéed red and green bell peppers, mushrooms, and peppered shaved steak all on a grinder sandwich roll. It is a variation on the steak submarine sandwich, as is the cheese steak. It is most closely associated with the New England region of the United States, where steak sandwiches are made by quickly grilling shaved steak on a griddle and then adding either cheese, or grilling the steak together with peppers and onions or mushrooms. If all three are combined together it becomes a steak bomb. The addition of salami or other preserved meats or pickles is optional and exact recipes and proportions vary widely. Nearly every pizzeria and sub shop in New England has their own version of the various steak sandwiches and the steak bomb. The SUB category embraces a number of subcategories (sorry about that), including the STEAK SANDWICH category, which itself embraces a number of finer types, including those named by the expressions Philly cheesesteak / Philly steak sandwich and steak bomb / steakbomb (some discussion of subtypes in a 12/19/15 posting). 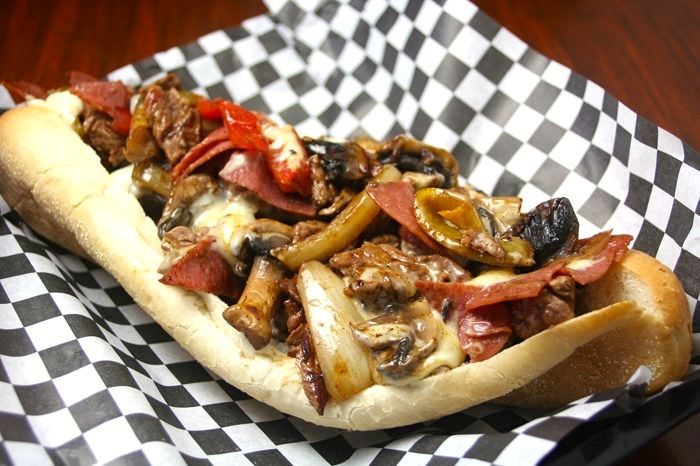 The steakbomb is a New Hampshire tradition stuffed with steak, cheese, salami or pepperoni, peppers, onions, and mushrooms (sometimes pickles too!). There’s something uniquely hearty, savory, and delightful about these sandwiches, and if you haven’t tried one yet these 8 spots are great places to start. You know a place that calls itself “Home of the Steak Bomb” has to make a good one – and Jitto’s delivers. This isn’t just a sub shop either – you can hang out in their bar and stay a while. Try it at 3131 Layfayette Rd Portsmouth, NH. What is a steak bomb? As a New England boy I know the answer to this question: It’s a sandwich that is overstuffed with steak, cheese, salami (or pepperoni), peppers, onions and mushrooms. You travel around New England and you come across this sandwich somewhat frequently, at many different delis. So what did USA Subs in Derry, NH do? They went to the U.S. patent office and had the term “steak bomb” trademarked. Then they promptly fired off a letter to their nearest competitor asking them to take the steak bomb off their menu. As far as I can tell, the USA Subs campaign came to naught. Steak bombs continue to sizzle all over New England. 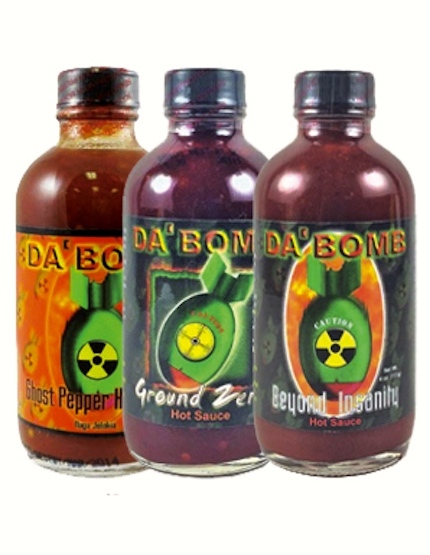 Da’ Bomb Hot Sauce Bundle has three of the hottest bad boys on the market. By buying all three, you can take your pick of the Ground Zero, Ghost Pepper or Beyond Insanity, or mix all three together for a culinary explosion. Great gift for the hot sauce fan in your life or the perfect addition to your hot sauce collection. A stink bomb is a device designed to create an unpleasant smell. They range in effectiveness from simple pranks to military grade malodorants or riot control chemical agents. The Guinness Book of Records lists two smelliest substances. One is “US Government Standard Bathroom Malodor”; a mixture of eight chemicals with a stench resembling human feces, only much stronger, designed to test the efficacy of deodorizers and air fresheners. Another one, “Who me?”, is a mixture of five sulfur-containing chemicals and smells like rotting food and carcasses. Much, much less savory than a steak bomb. This entry was posted on September 16, 2017 at 4:27 pm and is filed under Classification and labeling, Idioms, Language and food, Linguistics in the comics, Pop culture. You can follow any responses to this entry through the RSS 2.0 feed. You can leave a response, or trackback from your own site.